MORE Singaporean business leaders with the potential to help businesses here ride growth across Asia are set to be groomed under a new programme. It is to be run by the Economic Development Board (EDB) and the Human Capital Leadership Institute, which was established in 2010 by the Ministry of Manpower, EDB and the Singapore Management University. The Global-Leadership Accelerator Programme, to be launched at the end of the year, will be a multi-module course covering areas such as networking and the complexities of regional markets. Deputy Prime Minister Teo Chee Hean yesterday suggested it was an example of the Government's "continued commitment" to develop Singaporeans. 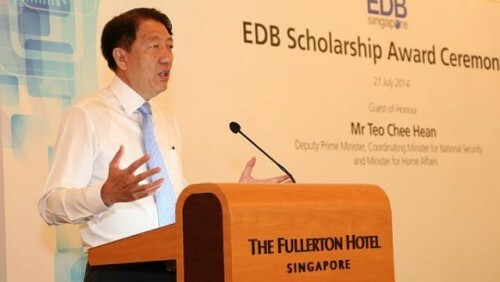 "As we grow and transform our economy, we will also continue to ensure that Singaporeans are equipped with the right skills and attributes to take up the new and exciting jobs of the future," said Mr Teo, speaking at the EDB Scholarship Award Ceremony at the Fullerton Hotel. Mr Teo, also Minister-in-charge of the Civil Service, added that EDB officers are working to make this a reality. In the past year, EDB officers helped establish the NUS Centre for Business Analytics, a partnership between the National University of Singapore and IBM. This is in response to the demand for data analytics, given an increasingly sophisticated consumer market in the region. Mr Teo said that to achieve sustainable growth, Singapore "cannot simply continue to do more of the same, or add more resources in a linear fashion". "Instead, we must position ourselves (where) we can add most value... This is the challenge for EDB officers of today, and EDB officers of the future," he added. EDB officers currently work across diverse industry sectors to help companies tap growth opportunities in Asia, including Asean, he said. "They match-make regional and global companies to create new business opportunities. They also support companies in deepening their understanding of the emerging markets in the region. "The strength of this public-private collaboration has played a critical role in Singapore's economic growth." One of six new scholarship holders at yesterday's ceremony, Miss Wu You, 19, said she especially looks forward to collaborating with companies in the field of clean technology and energy - an area of interest which started with her father, who has a doctorate in environmental engineering. "I grew up reading his research work on topics like water disinfection... It's a personal story, but also a macro trend," said Miss Wu, who will be studying engineering at Oxford University.